1 because seeing they do not see, and hearing they do not hear, nor do they understand. 3' and your ears, for they hear. 1' longed to see what you see, and did not see it, and to hear what you hear, and did not hear it. A parable is an earthly story that illustrates an eternal truth. Jesus often taught in parables to conceal truth from some people and reveal truth to others. You might ask why. Today’s lesson will answer the question. When Jesus began his public earthly ministry, he ushered in the spiritual kingdom of God and announced himself to be king of the kingdom. It is true. All that he did and said revealed his identity and purpose. There is mounting evidence that Jesus is God, the Savior and Redeemer for mankind. Among the great evidence is Jesus’ fulfillment of documented prophecies. The prophecies concerning the Christ were historically documented hundreds of years prior to the birth of Jesus (300 - 1,400 years prior). There is not a single prophecy about the Messiah that Jesus has not fulfilled. Clearly, God wanted everyone to be able to identify and come to know the Messiah. Jesus’ life, words and ministry testified that he is the Son of God, and many people testified to that fact. Some people believed that Jesus was God in the flesh and others did not. Yet, everyone was given the same opportunities to see, hear, understand and believe. God desires a holy relationship with people, and he makes provision for us to have such a relationship through Jesus Christ. Those who believe and live in faith with Jesus will enter the kingdom of God. Those, who do not believe and are unfaithful, remain in the kingdom of the world, separated from God and outside of his kingdom. The spiritual condition of our heart either enables us or disables us from seeing and hearing spiritual truth. 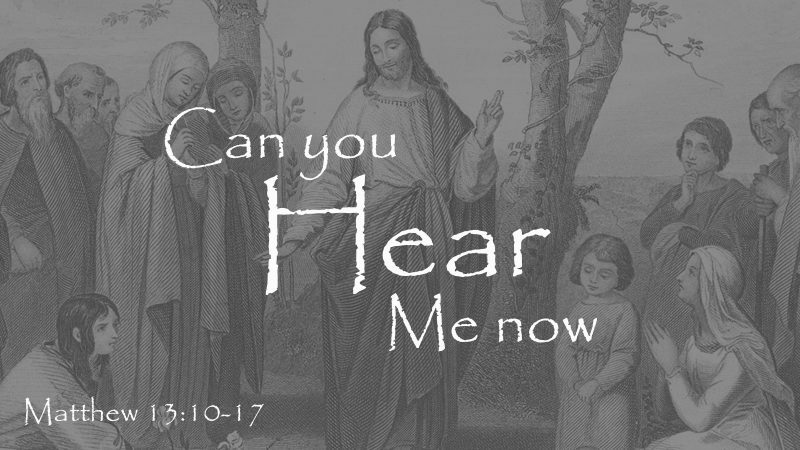 Jesus explained a problem for many who were physically seeing and hearing, but were spiritually blind and deaf: “This people’s heart has grown dull” (Matthew 13:15a). Their hearts are plagued with hardness, shallowness and self-indulgence. Such people are outside the kingdom of God, and the truths being taught by Jesus about the kingdom are hidden from them in parables because they have chosen not to enter the kingdom. Persistent disbelief of Jesus and disobedience to him causes cardiomyopathy, spiritual hardening of the heart. For those who refuse to believe, Jesus wisely does not reveal his kingdom truths, purposes and mission. Jesus is making his truth known to those who desire to be in true relationship with him and to those who are in relationship with him. He keeps spiritual truths hidden from those who choose to live outside his spiritual kingdom.